Whether you are a complete beginner in the kitchen or want to advance your skills, Cookery School can turn ordinary cooks into extraordinary cooks. I always wanted to try some English recipes but could never gather the courage if it was not for Cookery School. This recipe book has recipes by Richard Corrigan and teaches difficult looking dishes in a simple manner. It also describes the difficulty level of each dish and mentions the skills required. I tried apple tart from Cookery School and it turned out to be fabulous. I substituted a few ingredients but the result was as mentioned in the book. Roll the pasty out on a floured surface to 2mm thick and then cut into 12cm strips. Peel the apples, remove the cores and cut them into slices. Place the pasty on a cookie sheet and layer the apple slices on it neatly. Brush the apple slices with half the butter and sprinkle half the sugar on it. Bake the pasty in a pre-heated oven at 200C for 20 mins. After 10 mins, brush the apples with the remaining butter and sprinkle the rest of the sugar on it. This will help to caramelize the apples well. Chop the walnuts and roast them for 2 mins. 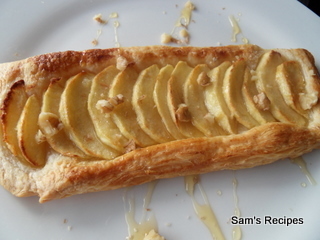 Drizzle honey and sprinkle walnuts on the apple tart before serving. This is an exotic dessert recipe that is absolutely the easiest also. You can close your eyes and make it. Absolutely nothing can go wrong with it and the guests will love it. Peel and core the apples and cut them into slices. Add ½ cup plain white sugar, ½ cup flour, cinnamon powder and nutmeg powder and mix. The flour is added to soak up the apple juice that oozes out while baking. Grease a baking dish and spread the apple mix in it evenly. In a separate bowl, mix the remaining flour, oats, remaining sugar, baking soda and baking powder. Add the unsalted butter and mix with your hands till the mixture is all crumbly. Spread this crumbly mixture on the apples in the baking dish. Pre-heat the cooker for 5 minutes and put in the baking dish. Bake for 40 – 45 minutes. 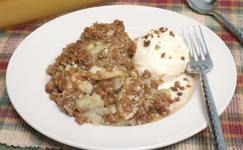 Tip: Serve hot scoops of apple crisp with dollops of Vanilla ice-cream. Garnish with chocolate sauce. Brown sugar can also be used in the oat mix instead of white one. You can also add nuts to the oat mix before baking.